These pretty and simple star-shaped earrings look fabulous, and will make a great addition to anyone's jewellery collection. 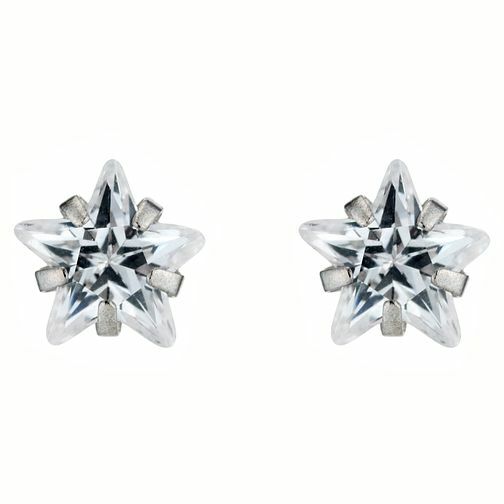 9ct White Gold Cubic Zirconia Star Stud Earrings is rated 3.0 out of 5 by 7. Rated 2 out of 5 by Anonymous from Lost 2 pairs in 1 month! I bought my daughter these and within a couple of weeks she had lost one as the backs are way too loose. I bought her another pair for Christmas and gave her rubber backs to wear with them but still she has it's another. I won't be buying any more! Rated 3 out of 5 by Anonymous from Pretty earrings Nice studs for everyday wear. Backs loose and one broke after a few months wear. I,m now using plastic backs and are fine.